Sure “Wall-E” is good, so is “Up”. I’m probably alone in the opinion that ‘Ratatouille’ was just OK, and that ‘Monsters Inc’ at least in my personal opinion is the best of the Pixar films. Pete Docter’s alternate reality runs parallel to our own – a world inhabited entirely by monsters with the ability to move themselves into our own through doorways into children’s bedrooms. The monsters run a business of scaring little kids in the sleep, capturing their screams and using it as a source of energy. It sounds completely ludicrous and slightly sadistic, but Docter manages to make the world logical, consistent and magical. Docter’s heroes James P. "Sulley" Sullivan (John Goodman) and Mike Wazowski (Billy Crystal) make a great co-protagonist pairing. Sulley is the company’s top scarer as maintained by a running scoreboard, a big burley blue beast tough on the outside but soft on the inside. His manager/business partner is a skinny runt of a monster, a giant great eyeball with arms and legs. Most of these Pixar films are essentially buddy pictures – two differing personalities clashing over the course of some kind of long journey - and on a level of physicality the shape and size of Sully and Mike make a great visual gag throughout the picture – like an animated Midnight Cowboy with Mike as Ratso Rizzo and Sully as Joe Buck. In the Monsters' world, there’s one steadfast rule, do not bring anything over from the other side. And so when Sully accidently brings over a cute little girl from her bedroom, he and Mike find themselves on the lam and desperate not expose their rambunctious little secret. Much of the film plays out like a ‘Three Men and Baby’ dynamic as these two bumbling monsters try to coral the intrepid little baby. Along the way Sully’s nefarious rival discovers the secret and plots to use her for his own evil deeds. For the betterment of the picture, emotional depth is kept to a minimum, with Docter concentrating on crafting the details of his doppelganger monster world. The film coasts along quite naturally on its consistently funny sight gags. Each monster is drawn with humourous detail - ie. the low level younger ladder climbing monsters with the teenaged hair cuts and braces, the CDA swat team monsters who emerge whenever there’s a security breech. Even the little girl, who isn’t so much a character as a prop, or a maguffin for the main characters to chase after, is visual gag – a naïve innocent running amuck through tightrope situations of imminent danger. Even in these moments, the gags are about physical movements, slapstick and comedy of errors. In the special features of new Disney Blu-Ray edition, Docter describes how he was given freedom to create 'Monsters Inc.' outside of the usual communal collaborative process under John Lasseter’s direction. As the first non-Lasseter film, “Monsters Inc.” would seem to have opened the door for filmmakers like Andrew Stanton, and Brad Bird to make even more creative films within the walls of Pixar. Finally! Someone else who thinks Monsters Inc. is the best of "The Pixars"! 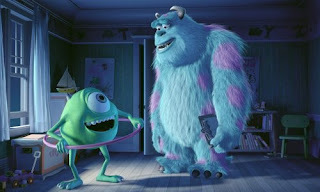 I agree that Monsters, Inc. is the best of Pixars! The others are also great but not like Monsters, Inc. that made an impact on that genre.